Dennis Miller Wins Top Award! The Mississippi Tennis Association is proud to announce the 2017 and 2018 Championship host sites. New 10 & Under Format! How would you feel if you received a letter like this? The new youthtennis.com website has been launched. 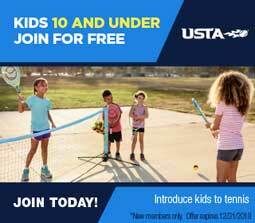 It is a great way for kids to challenge themselves at youth tennis games throughout the US Open! Check out the website and find out all the challenges and activities it has to offer! Tierney Holmes is the 2016 Mississippi Arthur Ashe Essay Contest Winner! Each year the USTA holds an Arthur Ashe Essay Contest for NJTL Chapters across the country. There are state winners and national winners. For 2016 Tierney Holmes from Greenwood is the MS winner. Tierney and one guest enjoyed an all-expense paid trip to the Winston Salem Open in Winston Salem, NC. Read more about Tierney Holmes is the 2016 Mississippi Arthur Ashe Essay Contest Winner! 2016 USTA Southern NJTL Leadership Camp! Read more about 2016 USTA Southern NJTL Leadership Camp! Mississippi Wins Big at the 18 & Over 2016 Southern Sectional Championships! Read more about Mississippi Wins Big at the 18 & Over 2016 Southern Sectional Championships! Larry Qu and Sebastian Rios headed to the "Zoo"
Read more about Larry Qu and Sebastian Rios headed to the "Zoo"
Our very own Birlette Jelks was featured on WABG in Greenville. He was named a Local Hero by USTA National!